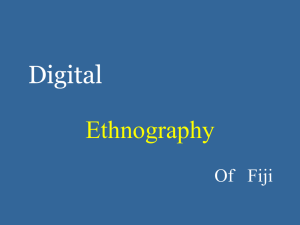 Ethnography (from Greek ἔθνος ethnos ""folk, people, nation"" and γράφω grapho ""I write"") is the systematic study of people and cultures. 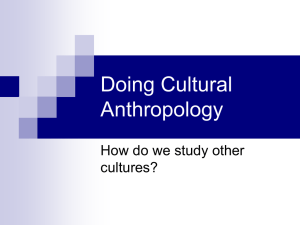 It is designed to explore cultural phenomena where the researcher observes society from the point of view of the subject of the study. 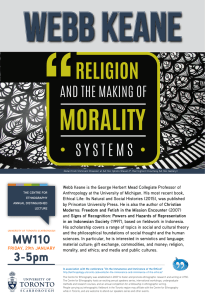 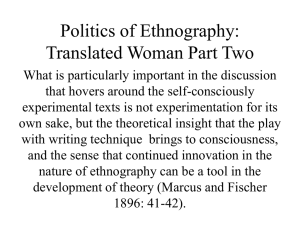 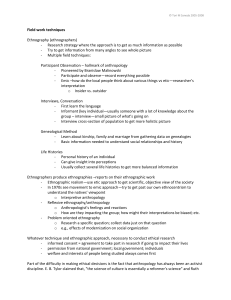 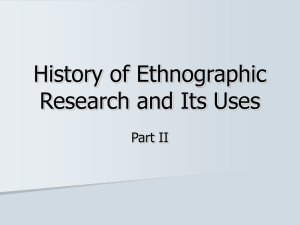 An ethnography is a means to represent graphically and in writing the culture of a group. 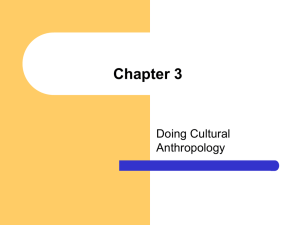 The word can thus be said to have a ""double meaning,"" which partly depends on whether it is used as a count noun or uncountably. 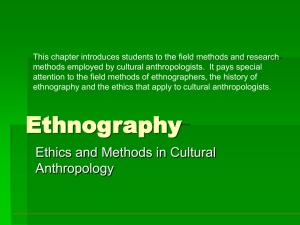 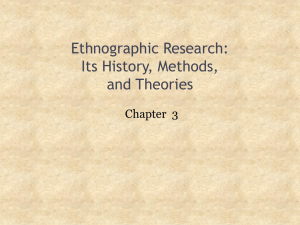 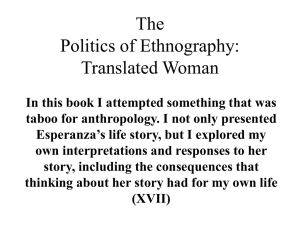 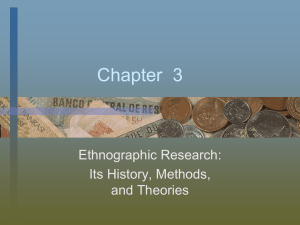 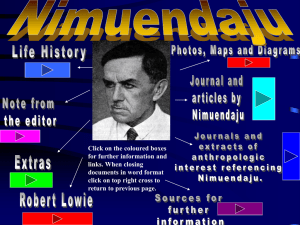 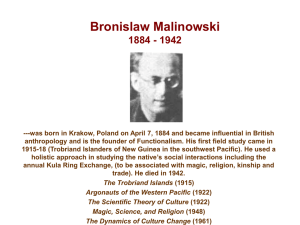 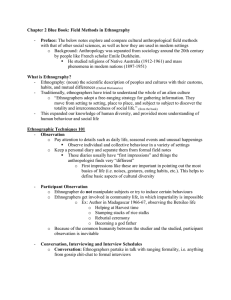 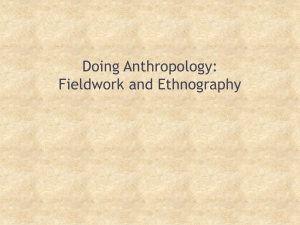 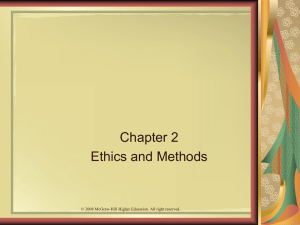 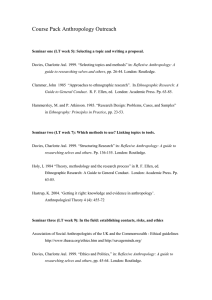 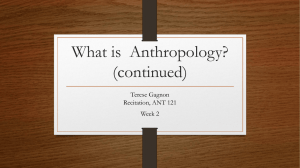 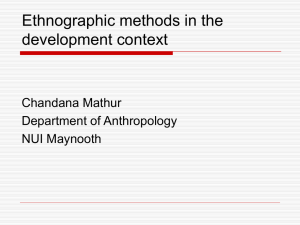 The resulting field study or a case report reflects the knowledge and the system of meanings in the lives of a cultural group.Ethnography, as the presentation of empirical data on human societies and cultures, was pioneered in the biological, social, and cultural branches of anthropology, but it has also become popular in the social sciences in general—sociology, communication studies, history—wherever people study ethnic groups, formations, compositions, resettlements, social welfare characteristics, materiality, spirituality, and a people's ethnogenesis. 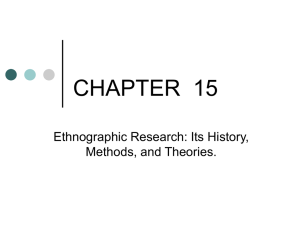 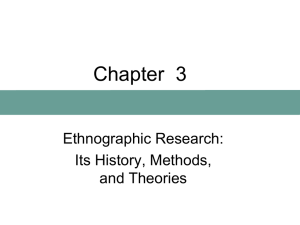 The typical ethnography is a holistic study and so includes a brief history, and an analysis of the terrain, the climate, and the habitat. 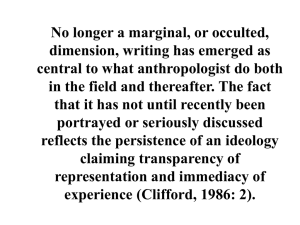 In all cases it should be reflexive, make a substantial contribution toward the understanding of the social life of humans, have an aesthetic impact on the reader, and express a credible reality. 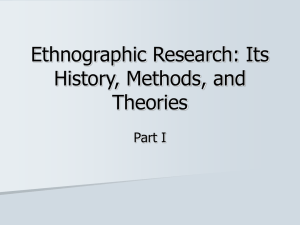 An ethnography records all observed behavior and describes all symbol-meaning relations, using concepts that avoid causal explanations.